This section explains how to migrate an InterPlay 2.1.0 installation to InterPlay 2.3.0, keeping all the data and preferences. Caution Before migrating InterPlay 2.1.0, you must migrate PassPort to version 4.6.0 SP12. The InterPlay version must be 2.1.0 with at least SP8 installed. Back up the AI Suite 2.1.0 database. The migration will update the databases to the new structure. Deploy the configuration from the Designer to the Repository and InterPlay if the installation contains Datastore. InterPlay and Datastore must have the same application version because the application will be migrated. Export the project's configuration from Designer 2.1.0 by clicking Export project. Each application should be exported in a corresponding folder. Common application name is default. Start the Repository console in [Install_path_2.1.0]/AISuite/Repository/startConsole. Note the runtimeApplicationName and runtimeVersion for InterPlay. Use [Install_path_2.1.0]/AISuite/Repository/extra/export as value for [exportFolder] in the steps below. You should check all your exits. There might be changes in the API. Stop all the products in AI Suite 2.1.0. The database must be running. Make an InterPlay 2.3.0 installation in a new folder and new database schemas for all components except InterPlay, choosing the same component names as the ones from 2.1.0. 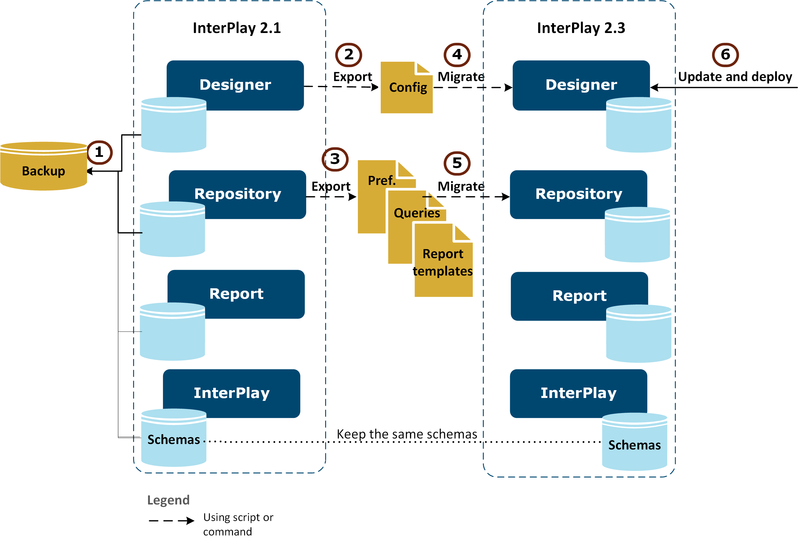 Perform the InterPlay 2.3.0 installation using the InterPlay 2.1.0 schema. When configuring the new components, make sure that they have the same component names as the ones from the 2.1.0 installation. When performing the 2.3.0 installation, select the Migrate from 2.1.0 option for the component, and use 2.1.0 schemas. Migrate the Designer configuration from 2.1.0 to 2.3.0 as described in this step. Ensure that the [Install_path_2.3.0]/AIS/Designer/extra/work/migration/ImportFiles_2.1 folder exists and is empty. Ensure that the [Install_path_2.3.0]/AIS/Designer/extra/work/migration/ImportFiles_2.2 folder exists and is empty. Ensure that the [Install_path_2.3.0]/AIS/Designer/extra/work/migration/ImportFiles_2.3 folder exists and is empty. Copy the Designer configuration that you exported in Prerequisites to [Install_path_2.3.0]/AIS/Designer/extra/work/migration/ImportFiles_2.1. Import the migrated configuration from [Install_path_2.3.0]/AIS/Designer/extra/work/migration/ImportFiles_2.3 into Designer. Deploy the configuration from Designer to Repository without cleaning. Specify the applications to be migrated from 2.1.0 to 2.3.0. To do this, configure the file [Install_path_2.3.0]/AIS/Repository/extra/migration/migrateTo_230/migration.xml. This file must contain the 2.1.0 application name and version in order to force the same version in the new installation.